We know SEO. Its in our name and what we are known for. We help you build relevance and authority to increase rankings. No tricks. No gimmicks or shortcuts. Just real marketing. Choose An SEO Package That Fits Your Needs. Modern SEO is about knowing how to optimize all aspects of your website. SEO involves technical components, content, links and credibility signals, and user engagement metrics. As competition and scope increases, so does the need to be stronger in each area. Our Search Engine Optimization – SEO packages are designed to influence the things that will help get your business ranked for the keywords that matter in your area. We track thousands of individual keywords daily, and monitor Google and other search engines for significant updates. Even as search engines continue to evolve, our core SEO processes have kept us leading the way in helping clients gain visibility in search engines, specifically Google. 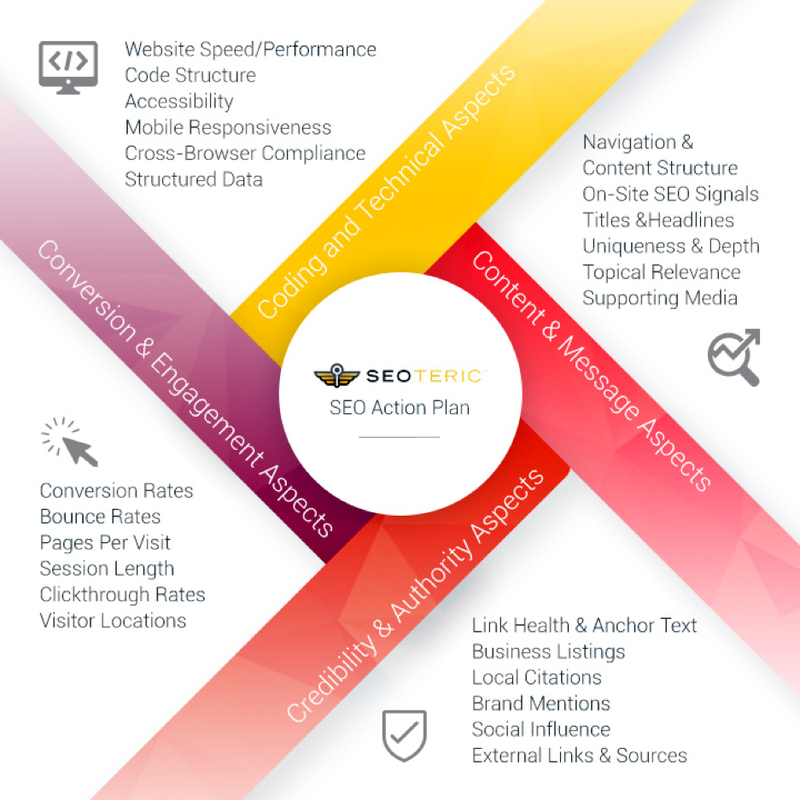 Our process is based on 4 pillars of modern SEO (You could call it the 4 “Cs”): Code and Technical Aspects, Content and Message Relevance, Credibility and Authority Aspects, and Conversion and User Aspects. Our SEO services are engineered to add value to your brand. When you work with us, you are building value for your website and your brand. The things we do to enhance your SEO are not tricks or shortcuts, but rather steps in building relevance and importance for you. Think about it. Google’s main goal is to give its users the best match for their searches. They want to return the most relevant result. That simply means the best answer from the best source. Boiled down, the results are ranked and weighted based on how accessible, relevant, and credible the website is, and how users interact with that website. Everything we do is centered around understanding how Google and search engines define relevance, and influencing the things that matter. If you refer to the chart above, we have a high-level look at the things we will work on for you. ll browsers and devices, including having a mobile layout for phones and tablets. We check robots.txt files, sitemaps and other technical details to ensure you are built on a solid foundation. We also may reorganize content into a better structure and utilize breadcrumbs so users and search engine bots know how content is related. There are hundreds of items to optimize from the technical aspect and we cover as many as we possibly can. Content is a critical part of website SEO. Without relevant content that answers the search query, it’s not likely that you will rank in search engines. We develop and optimize content for our clients that is unique and in-depth. In order to be seen as a resource for your customers or search engines you have to provide useful information. We often tell our clients that our goal is to help them become the wikipedia of their market. Give the user a helpful information center and FAQs, supporting images and video. If potential customers find information helpful, so will search engines. That will help you increase your visibility in search engines. So lets take a minute and discuss what “SEO content” really is. SEO is about creating relevance around topics. The days of simple keywords and keyword density are over. Your website needs to cover the topics and subtopics of your business, and answer the questions people type into a search engine. You still have the “vanity” keywords such as “example service in example city.” Then you have the searches done during the shopping/buying process such as “what is the best ….” or “how much does ___ cost.” Search has become more conversational and exploratory. Yes, the vanity keyword searches are important, but of equal (or greater) importance is to capture an audience that is engaged in the shopping and buying process by answering their questions and providing useful content. It isn’t about just getting the keyword on a page a certain percentage of the time. Google algorithms are getting better and better at understanding what “quality content” is. Simply put, “SEO Content” is quality content. Credibility and authority can be demonstrated by looking at a live business. A business that has been in an area for a while will naturally build relationships and connections. Those connections are a conduit to transfer credibility and authority. A business is seen as credible or authoritative by the people and businesses that interact and connect with it. The same is true for a website. We start by optimizing the things that a credible business should have. We create and optimize business listings on the website and services that people use. These listings provide valuable signals to Google about your brand, your location, and your business category. You also get local citations and links from these listings, and links act as a similar conduit for credibility, authority, and trust. We leverage relationships and content to produce good link opportunities. Google has become very good at devaluing manipulative link practices, so the links we build are based on quality and relevance instead of quantity and ease of acquisition. We monitor link profiles (or the collective history of all your website links) for relevance and quality every week to ensure that we have clean and relevant links pointing to our client’s websites. Conversion and specifically user engagement aspects are the wildcards of SEO. Imagine a website that does a good job in technical SEO, content, and credibility, but has a poor design. A user may find that website, and based on first impression or perception, they choose to leave and bounce back to Google. Do you think this website will continue to rank well? Google says no. If user data suggest a website isn’t a good match for a search query, that website may lose rankings. The user experience is vitally important to converting visitors into leads and customers, and to staying ranked well in Google. We optimize our websites for conversions, and that starts with a clean design and user friendly interface. Then you add in a fast website and easy accessibility with a mobile responsive design. Sprinkle in good content and a dash of credibility. Top it off with a clear call to action and easy to find contact numbers and forms. Then we track conversion data by page and by source so we can continue to optimize for the user experience and improve the amount of leads our customers get. We provide our clients with a weekly analytics report package that includes ranking positions of dozens to hundreds of keywords, visitor data, engagement data, conversion data, and visitor location data. This gives a complete look at how the website performs from a week to week basis with the previous 30 days of data. We also provide a monthly visibility report containing information about local business listings and citations for your business. These reports act as an optimization point where we can make data-driven decisions on next steps and how to continually improve. SEO (or search engine optimization) has evolved to the point where just about everything has an influence on your search rankings. Years ago, SEO was about keyword matching – get the keywords on the page and have keywords show up in links and you were doing well. This isn’t really the case anymore. As Google evolves and gets smarter, so does SEO. We also continually evolve our process to keep up with technology and marketing, and we encourage you to look at our SEO Process. Search engine optimization now needs a multi-faceted approach. Website performance, user engagement data, page load speeds, architecture, hosting, IP address, social influence and links all play a role in a website’s ability to rank. In order to succeed online, you’ve got to have a strategy to win where Google expects you to win. They want to see well built websites with relevant, unique, and in-depth content on a domain that has credibility and influence. There are many ways to build credibility and influence, and how much you need depends on your target market. The smaller the market, the less credibility you need to compete in search. We service clients in small to medium sized markets that just want to saturate their service areas. For these clients, SEO becomes about having great content and a well built website, and maximizing local influence. Getting local influence involves optimizing local business listings, Google+ and Google Local, and getting links and citations from other local businesses and directories. We help customers maximize their local influence to increase their rankings for keywords in their area. Visit our Local SEO page for more information on ranking in local markets. The bigger the audience, the harder it is to market to them with organic SEO. When the market is competitive or large, You have to layer your marketing efforts for SEO effectiveness. You start with the local influence near the business location and work your way outward. Once we have exhausted local resources, we turn to strategic link building. This is where we analyze competitors in your search space to understand what gives those websites the credibility to be there. It could be brand signals, a well known resource, lots of links from websites, great content, or all of the above. Much of what makes a competitor website rank can be measured and replicated. We look at all the important signals and create a plan to go after similar relevance signals. When it comes to link acquisition and link building, links fall into two main categories: informational links and relational links. Informational links can often be duplicated because they are found on information sites, directories, blogs, etc. Relational links often cannot be duplicated because a relationship usually precedes the link. In this case, we look to build our own relational links with clients, vendors, suppliers, complementary businesses, etc. by leveraging existing relationships or creating new ones with content, personal introductions, or other means. SEO on the large scale is about networking and building signals of credibility and authority. At the very core of what Google looks for is the best content from the best source, so you have to create great content and become an authoritative source for your market.